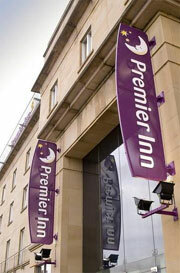 Clean and spotless approach to lodgings makes the Premier Inn of the best ‘value’ hotels in Edinburgh City Centre. Located just five-minutes walk from Haymarket Train Station. This Edinburgh Haymarket property specialises in budget accommodation that’s a notch or two above the no-frills and occasionally no-fun Travelodge hotels. Haymarket Rail Station is little more than a few hundred yards away on Haymarket Terrace, just South of Edinburgh Cathedral and all the gorgeous period buildings of the City’s Old Town. The Castle and the Gardens are also just a bagpipe’s breath to the North. The Edinburgh International Conference Centre EICC is only 300 metres away and Haymarket train Station just a few minutes walk down Morrison Street. Guests will find the Premier Inn about 6 miles east of Edinburgh airport and just a couple of hundred yards from Haymarket train station. Princess Street and Gardens are both within walking distance. Parking is limited and charges apply £8 per 24hrs.